Secrets of the Wings Fun Filled Halloween Party Ideas! Are you looking for a great idea for how to celebrate Halloween this weekend? 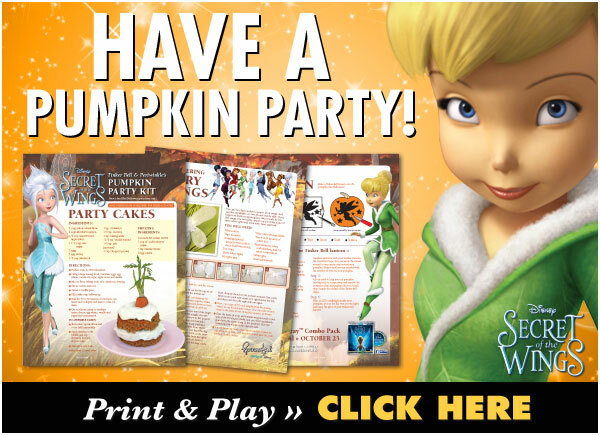 How about a Secrets of the Wings inspired Pumpkin Party brought to you by Tinker Bell and her fairy friends? Check out instructions on how to make a Tinker Bell lantern out of a pumpkin and easy homemade fairy wings as well as a recipe for the yummiest fairy friendly party cakes! Disney’s Secret of the Wings is now available on DVD. A magical movie for all the family! If you want just the Secret of the Wings DVD copy this is just $19.99 (from $29.99). Disclaimer: We received a copy of the Disney Secrets of the Wings DVD to facilitate our review. Our opinions remain our own! The Karate Kid Blu-ray + Casino Royal DVD just $6.99! Our Wittlebee Box Has Arrived + DM Readers Get 50% Off Their First Box of Children’s Clothing!